Nothing is more disheartening than opening the fridge and finding slimy wilted lettuce. While I rather make it a great addition to my meal, at least it will be to the compost pile! This has happened often in my refrigerator. At my grocery you can find heads of lettuce and plenty of packaged lettuces in bags or plastic boxes. I find the lettuces and spring mixes go bad quicker when they are stored in those containers. So how do we keep it all fresh? By what I’ve come across in my own kitchen, I think I’ve found a good method, and it’s happened kinda by accident! At the Goodwill one day I bought a salad spinner. I almost passed it up because everyone I know has made fun of the salad spinner! After all, why should we store something really big just to dry salad? It was a nice one, so I got it anyway, thinking I could at least use it to store lettuce grown in my garden. However I think the salad spinner has solved the issue of slimy lettuce, and that’s by controlling moisture. When I buy my lettuce, I chop the bottom off, and wash it in the salad spinner. Then I allow it to drain for a couple minutes. Then I spin it…drain…spin again…and drain off. I then add a paper towel, add the lid, and that’s how I store it in the fridge. I sometimes leave it as whole pieces of lettuce or I go ahead and chop it up for salad. It does last longer when you leave it as larger leaves. 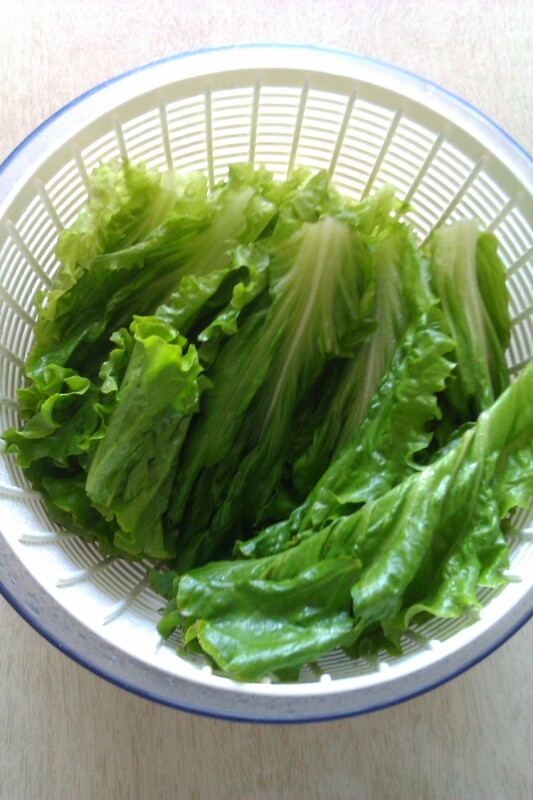 The colander in the salad spinner allows the moisture to go to the bottom and not touch the lettuce. The paper towel also absorbs any moisture the lettuce lets off. I think the large container also allows the lettuce to breathe, preventing it from getting slimy. A bonus is that the lettuce is ready to be eaten! This method has also helped me out because it’s faster to prepare my meal, and prevents the lettuce from being soggy from washing right before eating. It’s helped me to not waste lettuce and be healthier by having something convenient to fix!